I take a bit of time off from Facebook’s toxic noise. Good gods, I really should posting more often. However, I might cast some of the blame to the topic of this very post. Facebook. Lately, I have been keeping Facebook at arms distance – with hazmat gloves. Other than my duties as an Admin or a Moderator on various Pages and Groups, including work for clients, I have largely been leaving Facebook the hell alone, or at the very least, trying to limit my dosage. Over the past two years, especially since the Trump era, Facebook has descended from a somewhat weird and warped community space, to a terrifying echo chamber of screaming, flames, and snarky memes. It’s essentially devolved to two tribes of monkeys with different colored asses flinging monkey poo and shrieking at each other at the top of their lungs, and not noticing they’re in the same cage. I characterize myself somewhat left of center, like many art people, leaning liberal, but have some conservative views too. I suppose, I follow – “Tax fairly. Spend wisely, Try to balance the budget. Defend the nation. Protect the people. Equality before the Law. Help people where we can. Show respect for others differences. Stay the hell out of my worship and my bedroom, and your liberty stops the moment you stretch your arms and put your finger in my eye.” For this, acquaintances on the F-list seem to lose their freakin’ minds – on the Right and the Left. 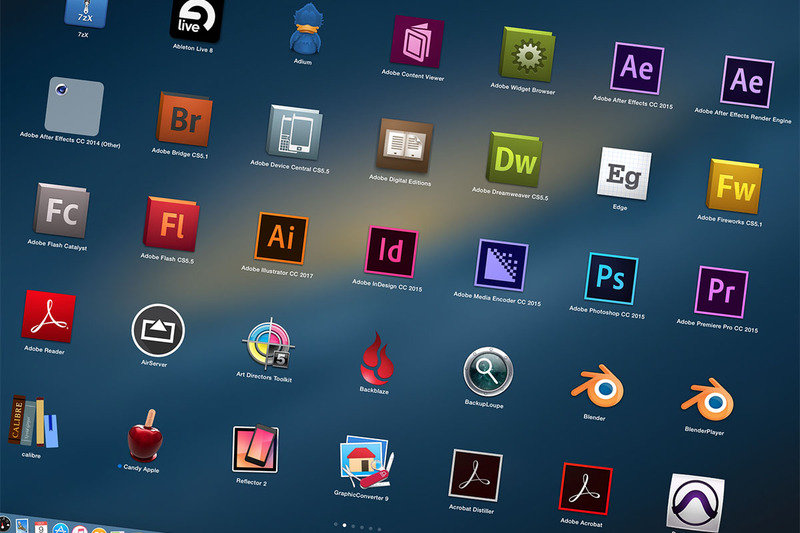 Graphic Applications on my Mac Pro. – Yep, the Big Kahunas are there. Recently I came across this post on the MacRumors Design and Graphics forums. – Chris7, Mar 10, 2010. There were a lot of thoughtful replies over a few years, so it might be worth your time to visit the thread and read through them. A lot of good recommendations. It was also very interesting to see the trends in design and publishing software evolve over the multi-year span of the thread. What was common, even essential, even a decade ago falls by the wayside, and new entries rise in prominence and usage. However, I noticed my comments weighed in at article length, so felt they were worth sharing, with some clarifying edits. Hope you find them worthwhile. If you look at some of the (few) job listings out there, the short answer is, apparently, ALL OF THEM. But the practical reality is: the software your Employer/Client uses in their shop. Which could be state of the art everything on cutting edge machines, to legacy dedicated-purpose applications from the 80s running on ancient Windows NT boxes they can’t update, as the software publisher went under in 1997. As a battle-scarred veteran of the Desktop Publishing wars, I entered the field in 1980 B.C… Before Computers. When DTP came along in the 90s, it was heavily marketed as a way to eliminate entire art departments. Since then, it has been discovered that training, taste, the ability to draw, and understand principles of Design still makes a difference. This revelation lead to the the idea that giving Creative Pros robust tools and paying them was more effective than giving them to High School interns. However the ubiquity and strength – what nuclear missile guys would call “throw weight” – of our digital tools has put a LOT of talented people to pounding the floors in Walmart, if not on the street. A spectrum of design assistants and outside services I would have employed and used in the 90’s are now all contained within my workstation and software. Having been at this for over 35 years, and from time to time taken a few moments to digitally restore some of the work recovered from the house fire, the not entirely (well, a little) insane notion came across me that I should pull together a retrospective of some of my better work from my student days to the present. The original thought was it would make a nice giveaway to friends and some of my better clients. Given that the technology to self publish and offer print-on-demand is out there and getting better year after year. 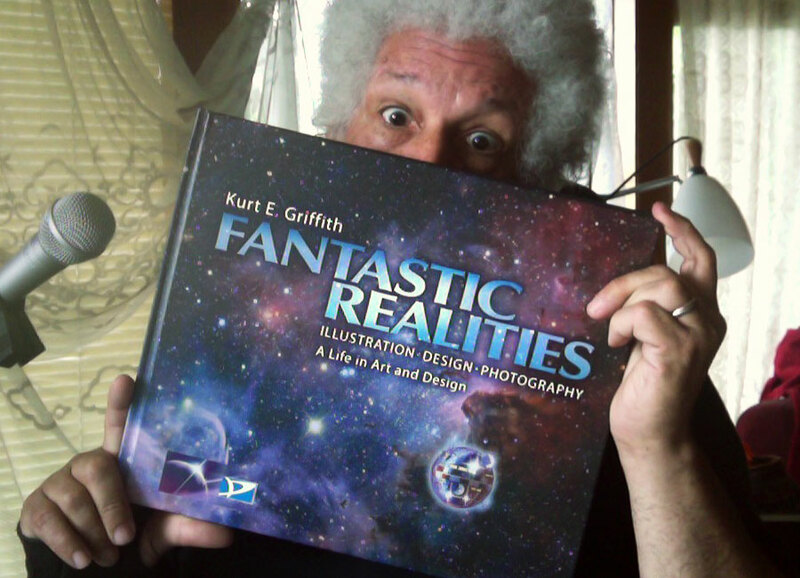 So I started to pull together FANTASTIC REALITIES: A Life In Art & Design. A labor of voluminous free time and love. Was quite the trip down memory lane. Also some minor frustrations as I discovered that some storage and archive technologies did NOT stand the test of time. So for instance the breakthrough digital files of the 1996 Witches Ball Poster are apparently lost to digital mischance. ZIP Drives, anyone? Retrospect Express on a Pre-Power PC Mac? Hoo Boy. But I scanned, reconstructed, touched up. Sniffled a little over fire damaged originals. Curated my own collection. Let me tell you, that is an exercise in humility. 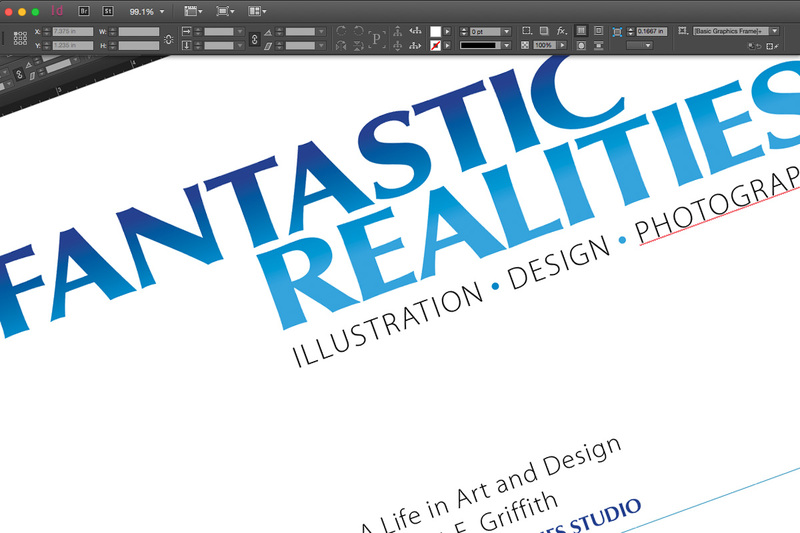 There were a few moments of, “oh god, I got paid for this?” But finally I was able to pull together the book in InDesign, and had an editor friend give the text a once-over. And I sent it up to the self-publishing site Lulu.com. Got my Authors copy… it’s stonkin’ beautiful! Beautiful… and too frickin’ big. I was not in a patient mood today for fools and shysters. But I was able to suppress my annoyance and compose a reasonably polite and professional response. Identifying data has been redacted to protect the guilty guilty guilty…. I am the Web Designer and maintainer for [redacted domain name]. I am well aware of the scope and limitations of my client’s current site. It is on deck for a redesign and re-build. Of course that depends on my client being motivated to do so and dedicates the required resources. Be that as it may, such a project is well within the skill set and resources of my studio. That is entirely up to us. However, I would be far more confident if your message included legitimate contact information, a company name, web site, and any other suggestion that you might be legitimate — or even an actual person. I did visit [redcated URL (from email address)], and that visit does nothing to reassure my opinion. 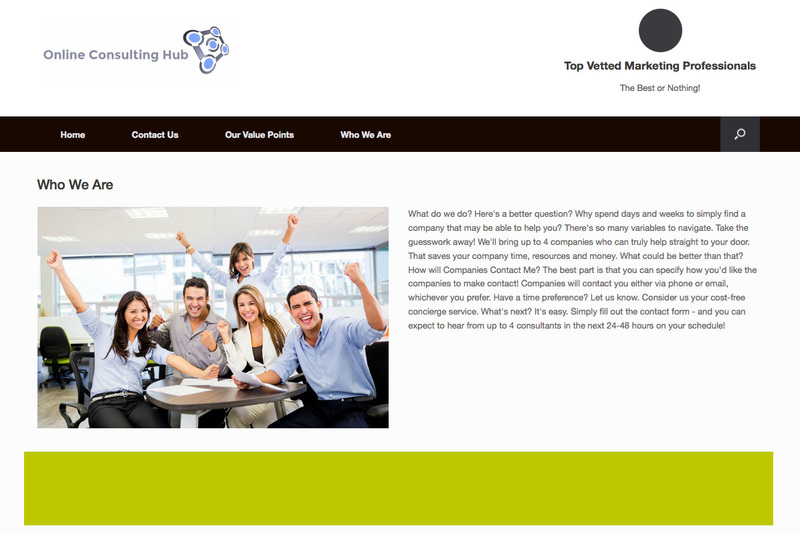 It is a generic site full of generic marketing copy and stock photography, utterly lacking in specificity of any kind, a legitimate address, a phone number, testimonials, portfolio, customer list, or even a single named principal or employee. Your “Who We Are” tells me exactly NOTHING of value. A Google search of “[redacted company name]” produces NO company information, reviews, or even much in the way of search results. Did you think I would not vet you? There is no way I would trust a client’s money and my credibility to a company that does not even seem to legitimately exist. I am not impressed. There is honestly no THERE there. Please move on to more gullible prospects. In more explicit terms– piss off, I’ve got work to do.